Last week, we reported that St. John the Baptist Church was being desecrated by the modern “art” of Tom Herck, featuring a crucified cow surrounded by a pool of 5,000 liters of milk. This church was not the sole object of Herck’s desecration: Pictured above is one more work that was on display in the Gasthuiskapel (Guesthouse chapel) of Borgloon, another historic church in Borgloon, Belgium. What makes this exhibition particularly nefarious is the use of demonic imagery – such as the black horns and animal skulls pictured above – combined with Catholic symbols such as the Christogram (on the bottom of the far-right skull pictured above) and the pyramid with the Eye of Providence, originally a Catholic symbol (see Pantermo’s 16th century painting The Last Supper at Emmaus), later adopted by the Freemasons in the 19th century. This combination of imagery that is demonic, Catholic and Masonic is already bad enough, but to house it in a historic Catholic church is desecration on top of desecration. Prelates placidly wash their hands of this, however, since the historic Gasthuiskapel has been de-consecrated. Nevertheless, it is an extenuation of blasphemy when Prelates allow demonic art in a church under the pretext it is no longer dedicated to the cult. The fact is that the structure not only hosted the Sacrifice of the Mass, but also Our Lord in the Blessed Sacrament; as such, it deserves our utmost respect. Some locals understood this and, in reaction to this profanation, they attempted to set fire to the exhibit on November 18, 2017. 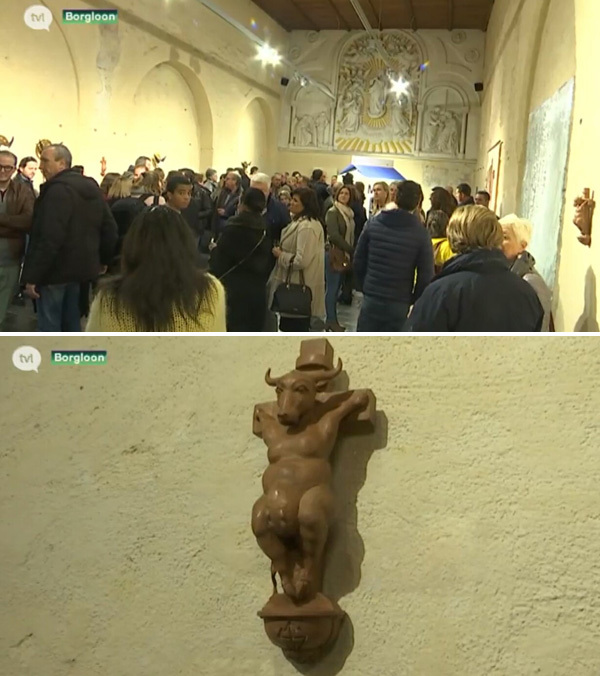 It is hypocritical for Herck and his supporters to pretend to be surprised by this reaction, given the blasphemous and provocative nature of the exhibit. Mayor Danny Deneuker was equally disapproving of this popular reaction and supports Herck’s “right” to free expression: “It is, of course, up to the artist to give substance to what he wants to show. Everyone can also have a personal opinion. You can be for or against it, but vandalism is prohibited. If everyone takes the law into their own hands, then we are far away from home," said Deneuker. this profanation took place. So far, Hoogmartens has refused to comment, and neither has he taken any action to remove the exhibit. To profane a former Church of Our Lord is to outrage Our Lord himself, a crime that Bishop Hoogmartens and other progressivist Prelates will have to answer for when they stand before God on Judgment Day. Does Francis Endorse the Blasphemies of Scorsese?